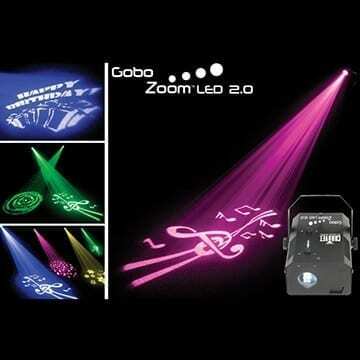 Chauvet Gobo Projector is the light the pros use at concerts to project shapes and textures across the stage. This easy to use gobo projects words onto any surface to create messages such as Happy Birthday. You can also project shapes or even create textures such as snow! Each filter is called a gobo and this unit comes with 9 gobos and 4 color gel overlays.Because it is powered by a 15-watt LED, this is a powerful gobo projector. Heat-free LED power allows users to create custom gobos. Custom gobos are easily created from transparency material. A variable 18° – 26° beam angle allows for crisp focusing at a variety sizes. DMX control easily incorporates it into shows. *All lighting requires installation, power and may require trusses and/or lighting tripods.